Creating a social media strategy is very important to reaching your goals. If you don’t have goals for your social media, then why do you have a page or a twitter account? If you are like most professionals who use social media to engage an audience, there isn’t enough time in the day to do it all. So what do you do with the time you do have? In this post I’ll explain how to use advanced scheduling tools to implement your social media strategy when you have little to no time. 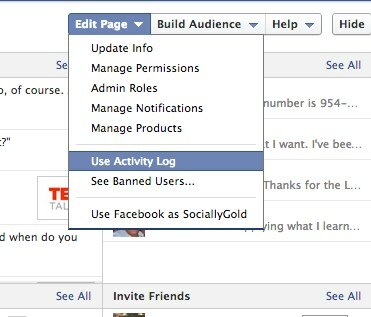 Facebook has allowed scheduling of posts in advance since May, 2012 and lets you post up to 6 months in advance. 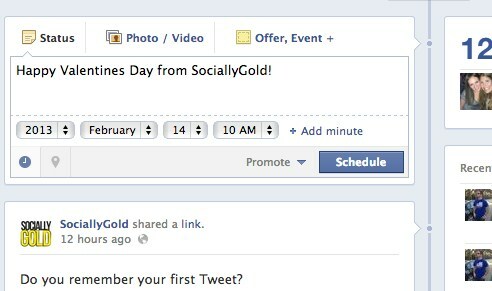 You’ll need to initially set a Facebook page creation date before you are able to schedule posts. If you work during the day, chances are your audience does too and they aren’t looking at their Facebook until they get home, plus your too busy to post on Facebook all day. Dedicate as little as a half hour a day to schedule posts and comment on any replies you received the day before. You should comment on every post and or tweet you receive. No one likes to be ignored. C’mon now! To activate this screen click on the clock icon to the left of your status update. You can view all of your scheduled posts by clicking on “Activity Log” under “Edit Page” which gives you access to all your posts; past, present and future. Once you schedule your post, you’ll see it in the Activity Log. *Be careful: We know that Valentines day isn’t going to get canceled, Hallmark won’t allow that, but say that it did for this example. It’s important to make sure you cancel this post in your Activity Log so you don’t confuse your audience. Also, take note that only page admins can see the activity log. It’ll be your little secret. There are a lot of 3rd party applications and sites that let you schedule posts in advance. I use Crowdbooster. I have highlighted Crowdbooster in a previous post on how to determine the best time of day to post based on your audience. You can also use it to post in advance based on those times. Creating an account is free, which allows you to set up one Twitter and one Facebook account to monitor. You’ll need to pay if you want to manage more accounts. Crowdbooster allows you to schedule your Tweets and Facebook posts throughout the day. I only recommend using it for Twitter because Facebook penalizes you for using a 3rd party posting service like Crowdbooster by not showing it to as many of your fans. Twitter on the other hand, does not penalize. Schedule your tweets in advance to post throughout the day so you remain consistent. When I come across a Twitter account that doesn’t post consistently, I tend not to follow them. Do you have a better understanding of how scheduling works? Let us know in the comments. This posts was not endorsed by Crowdbooster and is simply a tutorial on how to schedule posts in advance. The opinions in this post are purely my own and not influenced by monetary values.